China and Egypt are going to jointly hold a series of cultural events this year. More than 100 different kinds of events will be held to mark the China-Egypt Cultural Year. Sixty-three events will be held in China, and another 39 in Egypt. Lu Yanfei, with Ministry of Culture says the Culture Year will benefit future development between the two countries. "Both ancient China and Egypt are members of the world's four ancient civilizations, with splendid histories and cultures. The two countries also have made great efforts in developing modern culture. So the upcoming Cultural Year will enhance friendships of the two countries. It will also bring new opportunities for cooperation and boost mutual understanding between the people." The events will cover music, dance, film, and literature, as well as personnel exchanges between youth. Magdy Mahmoud Amir, Egyptian ambassador to China, says he hopes the events can help the Chinese people develop a better understanding of the culture of Egypt. "This year marks the 60th anniversary of the two countries' establishing diplomatic ties. To celebrate 2016 as a Cultural Year was among agreements reached by President Xi Jinping and visiting Egyptian President Abdel Fattah el-Sisi in 2014. 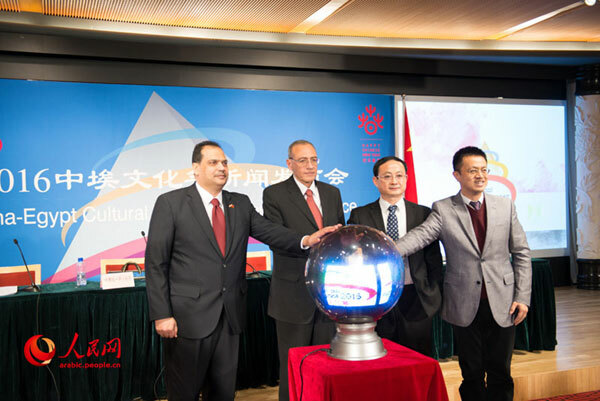 The Cultural Year will see the two sides work together on a series of activities including music, dance, food, artists exchanges, tourism and the exhibition of relics. We hope these events will boost two people's mutual understanding." The opening ceremony of the upcoming Cultural Year is expected to be held in Luxor, Egypt.